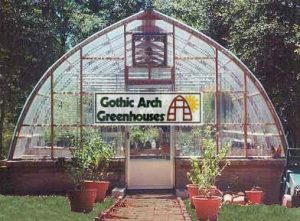 The Gothic-arched greenhouse design is, as our name implies, our signature product. In the 1950s, relationships with the many ornamental nurseries in the Gulf Coast area helped steer the company’s initial import/export focus toward horticulture. 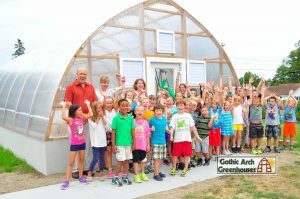 But it was through the eventual association with the agricultural colleges in Alabama that the Gothic arch became Gothic Arch Greenhouses’ flagship design. While university programs could boast higher-end greenhouses featuring aluminum, steel or glass, secondary and post-secondary vocational ones could not. From that need for affordable, yet durable greenhouses, the Gothic-arch style became our initial focus. 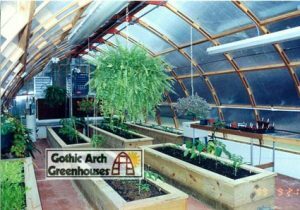 Now decades later, we still stand behind this design for all of these reasons a Gothic-arch style greenhouse is a great choice for growers today. Durability. The Gothic-arch design is well-regarded for its ability to withstand strong winds and heavy snowfall. The half-teardrop shape of the roof is ideal for allowing snow and rain to easily run off and preventing damage from substantial accumulation of precipitation or debris. Efficient Construction. 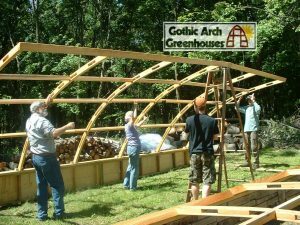 The arched roof of the Gothic Arch Greenhouse eliminates the need for structural trusses. This technique requires less construction material, which not only helps reduce costs, but also makes construction faster and easier. Flexible Design. Because of the Gothic Arch Greenhouse design, you have some options when it comes to the installation. Whether you mount the greenhouse at grade level or higher on a foundation wall, you can decide how high you want to locate the structure. More Overhead Space. The Gothic arch features more height from the high profile of the ridge in the center, which creates space for growers who specialize in or want to try their hand at taller specialty crops (like tomatoes and cucumbers), as well as many tropical trees. Aesthetics. Many growers appreciate the simple beauty of the Gothic-arch design. A variation of the Quonset style—which features a semicircular frame—the Gothic arch, as its name implies, gets its graceful curve from the walls being bent from the base, making a graduating curve that peaks at the roof. Is the Gothic-arch style greenhouse right for you? 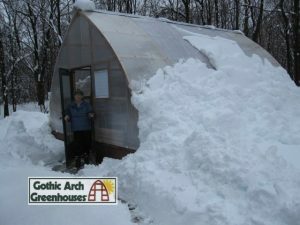 If you still have questions, please contact our friendly representatives at 800-531-4769 or visit www.GothicArchGreenhouses.com, and we’ll be happy to assist you with your purchase! This entry was posted in Greenhouse Information and tagged benefits of gothic arch, gothic arch greenhouse, greenhouse design on October 5, 2017 by admin.